Earlier titled Tantrik, Bhoot Police was supposed to star Abhishek Bachchan in the lead. Fatima Sana Shaikh stated that the entire concept of a "bunch of strangers" whom she had never met, writing things about her, used to unnerve her. Apart from Fatima Sana Shaikh, the ensemble cast of Anurag Basu's film consists of Abhishek Bachchan, Aditya Roy Kapur, Rajkummar Rao and Pankaj Tripathi. Thugs of Hindostan had a record-breaking opening day at the domestic box-office, but later faced a significant slump in earnings. 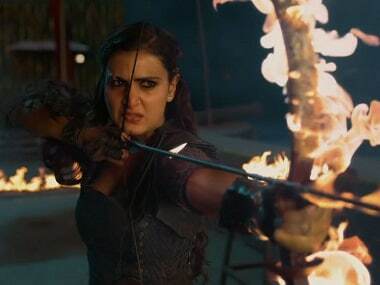 Fatima Sana Shaikh starred in Thugs of Hindostan alongside Aamir Khan, Katrina Kaif and Amitabh Bachchan. After scoring a record-breaking opening of more than Rs 50 crore, Thugs of Hindostan has seen a regular decline in its daily box office collection. Thugs of Hindostan earned Rs 4.35 crore from its Hindi version while its Telugu and Tamil versions grossed only Rs 40 lakh, collectively.